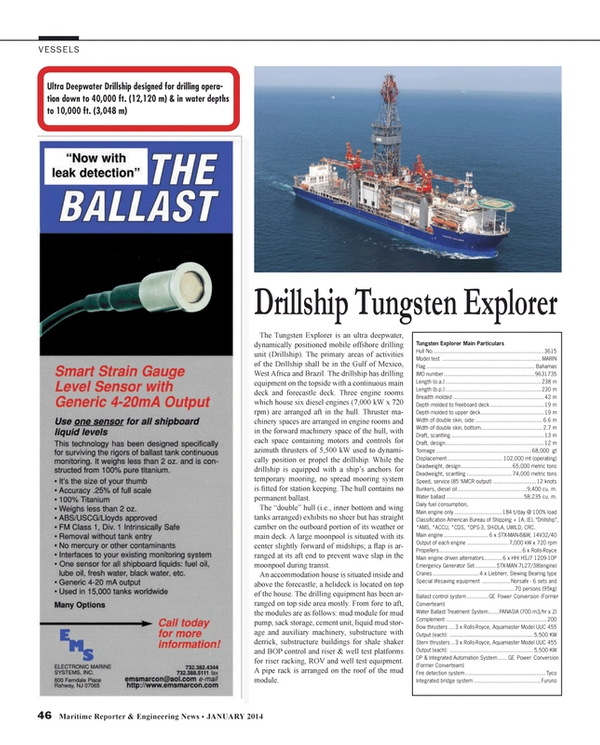 The Tungsten Explorer is an ultra deepwater, dynamically positioned mobile offshore drilling unit (Drillship). The primary areas of activities of the Drillship shall be in the Gulf of Mexico, West Africa and Brazil. The drillship has drilling equipment on the topside with a continuous main deck and forecastle deck. Three engine rooms which house six diesel engines (7,000 kW x 720 rpm) are arranged aft in the hull. Thruster machinery spaces are arranged in engine rooms and in the forward machinery space of the hull, with each space containing motors and controls for azimuth thrusters of 5,500 kW used to dynamically position or propel the drillship. While the drillship is equipped with a ship’s anchors for temporary mooring, no spread mooring system is fitted for station keeping. The hull contains no permanent ballast. The “double” hull (i.e., inner bottom and wing tanks arranged) exhibits no sheer but has straight camber on the outboard portion of its weather or main deck. A large moonpool is situated with its center slightly forward of midships; a flap is arranged at its aft end to prevent wave slap in the moonpool during transit. An accommodation house is situated inside and above the forecastle; a helideck is located on top of the house. The drilling equipment has been arranged on top side area mostly. From fore to aft, the modules are as follows: mud module for mud pump, sack storage, cement unit, liquid mud storage and auxiliary machinery, substructure with derrick, substructure buildings for shale shaker and BOP control and riser & well test platforms for riser racking, ROV and well test equipment. A pipe rack is arranged on the roof of the mud module. Bunkers, diesel oil 9,400 cu. m.
Water ballast 58,235 cu. m.
Classification American Bureau of Shipping + 1A, (E), “Drillship”, *AMS, *ACCU, *CDS, *DPS-3, SH-DLA, UWILD, CRC.